Train horns that have blared along the University of Colorado A-Line tracks hundreds of times a day for more than 1,000 days will at long last fall silent at Denver’s nine rail crossings on March 1. 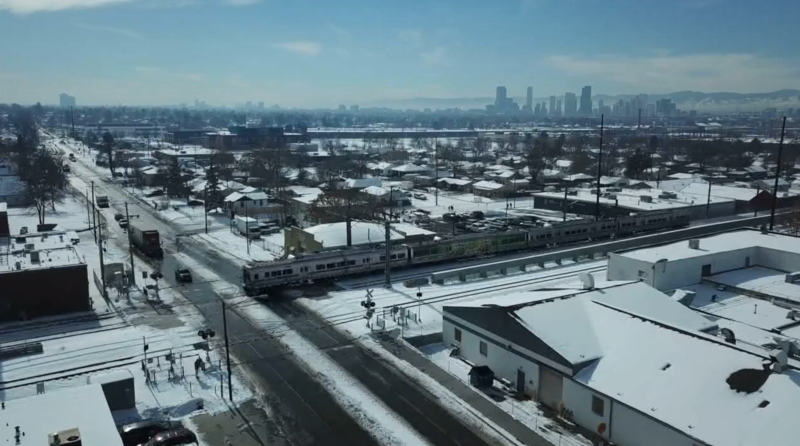 DENVER — Train horns that have blared along the University of Colorado A-Line tracks hundreds of times a day for more than 1,000 days will at long last fall silent at Denver’s nine rail crossings on March 1. The two remaining A-Line crossings in Aurora have yet to receive a date for quiet-zone status, but during a press conference Friday, Regional Transportation District General Manager Dave Genova said efforts to get the horns quieted there are “very close” to being realized. Genova said Denver submitted its application for quiet zones with the Federal Railroad Administration on Thursday, starting a 21-day clock for federal regulators to give final review to the application before permitting trains to whiz through crossings without sounding their horns. Friday’s announcement will no doubt come as a massive relief to thousands of residents who live near the A-Line tracks, some of whom have had to resort to closing windows during the summer and wearing earplugs at night for nearly three years. The Doubletree hotel on Quebec Street in Denver, directly north of the A-Line tracks, has provided ear protection and white noise machines for guests who have trouble sleeping through the horns, which sound 21 hours a day. Read the full story from our partners at The Denver Post.